This weekend we celebrate Memorial Day in the United States of America. Truth be told, for many years, I never understood what or who we were honoring on this day in late May. For me, it was just a long weekend marking the beginning of summer. Growing up in Rhode Island, the Memorial Day holiday was a weekend of cookouts, pool parties and family fun. In my later youth, living on Cape Cod, this day included some of the festivities of the earlier days but with more traffic and more ocean. I never really understood we were honoring men and women who made the ultimate sacrifice in defense of our country. I understand this now. They tell me, 150 years ago the Commander-in-Chief of the Grand Army of the Republic established what we today call Memorial Day. Then, it was a day set aside to honor the men who died in defense of the Union in the Civil War. Today, it has grown to be a national holiday celebrated to honor women and men who gave their lives in defense of this country in every war. A few years ago while doing some genealogical research, I was re-introduced to an ancestor of mine who gave his life for his country. He fought for the Union cause and died in 1862. His name was William H. Wood. William was the brother of my 2nd great-grandmother, Harriet Wood, making him my 3rd great-uncle. My paternal grandmother, the granddaughter of Harriet Wood, told me about her Great-Uncle William who died in the Civil War. I wasn’t much impressed with this story back then but the memory of this conversation returned to me later in life and it touches me deeply today. William married Phebe Lloyd and they had a number of children with only one reaching adulthood. William worked for the Boston and Sandwich Glass Company in Sandwich, Massachusetts before volunteering to serve in the Massachusetts 29th Infantry Regiment, Company D. He mustered on May 22, 1861. The records tell us he died on January 16th 1862 in Newport News, Virginia of yellow fever. He is buried on a lonely knoll in Bayview Cemetery in his hometown of Sandwich, Massachusetts. For a few years, I searched for William’s grave with no luck. Last year, after pouring over old cemetery plot maps, which provided no indication that William was buried in Bayview Cemetery, I decided to take a stroll down one of the rarely used cemetery pathways. I had walked this pathway before but for some reason I missed the stone. This day was different and my eye was drawn to the left as I strolled along on this summer day. I was surprised when I saw the name, “Wood” on a nearby stone. “Could it be?” I wondered. Upon closer observation, I read the name William. There it was. “I’ll be darned,” I thought to myself. It was bit moss-covered but there it honorably stood on a knoll near other graves of that era. I paused for a moment in gratitude for discovering the grave and in silent honor for the sacrifice William made so many years ago. I thought about the feelings William must have experienced dying all alone in the far away land of Newport News, Virginia. I also thought about my ancestors gathered on this hill to say their goodbyes to William over 150 years ago. After a few moments of solemnity, my mood changed to delight at my discovery. I called a friend of mine, exclaiming, “You’re not going to believe who I found!” After sharing who I had discovered, I suggested we meet at the cemetery, say a few words of thanks and enjoy a picnic on the hill. After cleaning up the stone a little bit, we did just that! It’s probably an odd thing to honor a soul with both quiet reverence and a joyful picnic. We humans are interesting that way. Sometimes life isn’t either/or but rather and/both. We celebrated with a touch of solemnity and then with a touch of joyful jocularity on the hill that day. 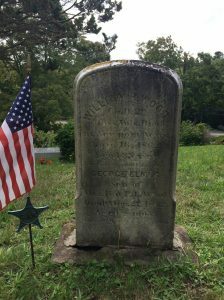 This year, I was hoping to return to Sandwich, Massachusetts on Memorial Day to place a flag on my great-uncle’s grave in honor of his service. Unfortunately, my health limits my ability to travel this spring so I must honor my Great-Uncle William in a different way from afar. And as I honor my great-uncle, I also honor all the men and women who made the ultimate sacrifice for our country. I am especially reminded of those soldiers, like my Great-Uncle William, who didn’t die on the raging battlefield of war but died from associated circumstances of conflict in a more remote location. They too died heroically and gave their all for their country. I’m thinking of men and women who return from war, even to this day, living for a time with PTSD, physical wounds, chemical exposure illnesses, depression, etc. only to die far removed from the conflict from the lingering consequences of their war-time duty. Lives cut short. Not all war-related deaths take place on the battlefield. So this Memorial Day, as we celebrate the holiday with barbecues and family get-togethers, I am keenly aware of the reason for the holiday and I know that I will be one of the many Americans who takes a moment to reflect upon the honor, courage and commitment displayed by those men and women who died in service to their country. We owe them a great debt of gratitude. 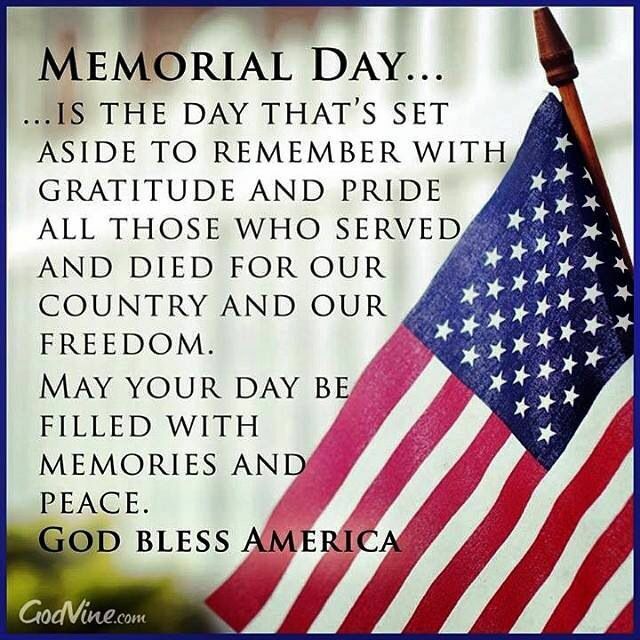 May your Memorial Day festivities be filled with solemn remembering, joyful celebrating and lasting family memories. I believe this may be a favorite of all the blog posts you’ve written so far. I can imagine your excitement upon finding your uncle’s tombstone after such a long time of searching. I was also touched by your story, and my eyes blurred with tears as I read it. Keep writing and keep sharing. May God bless you, my dear friend in Christ. Angelita, Thank you for your kind words! Whenever I write, I always hope you read and enjoy my words! You inspire me to keep writing! Thank you! Andrew, what a lovely story! And the picnic on the hill sounds perfect! But I am sorry to hear that you are having health issues. Hope it’s just a “Spring thing” and that you will soon be travelling again. Thanks for the comment, Linda! Andy – you are a beautiful writer. I especially liked this: It’s probably an odd thing to honor a soul with both quiet reverence and a joyful picnic. We humans are interesting that way. Sometimes life isn’t either/or but rather and/both. We celebrated with a touch of solemnity and then with a touch of joyful jocularity on the hill that day. In addition to simply enjoying your prose, I find I usually learn something as well! Thank you! Thank you, Pam, for your kind comments! Very well written, Andrew. Well done. Brad, Thank you for taking the time to read my blog and to leave a comment of support!